The Social Change Summit takes place in the CIG and attracted about 100 attendees this year. The event would not be possible without the collaborative efforts of the David and Frances Brain Center for Community Engagement, Center for Innovation & Growth, LaunchNET, Center for Inclusion, and Strive. 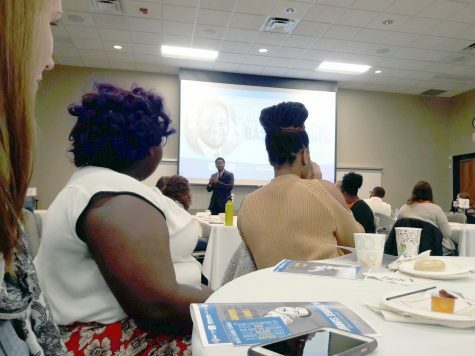 This year’s theme was “Defining the Challenges, Creating the Change.” Approximately 80 Baldwin Wallace University students attended this year along with 20 community members. The opening session started with Basheer Jones, the Ward 7 Councilman. Elected in 2017, he became the city’s first Muslim council representative. Councilman Jones spoke on a variety of topics from what it meant to be a leader, how he started, where he came from and the influence it had on his career, and messages to students about being the next generation of change. After the speaker, students chose their first couple of sessions regarding issues surrounding the community. Some of the sessions regarded information about homelessness, refugee crises, LGBTQ+ advocacy, empowering changing family structures, and multicultural perspectives on mental health. There were opportunities to reflect with other students about the experience of each session attended throughout the day. The lunch was sponsored by Bloom Bakery which is a local organization that, “employs individuals who face barriers in a steady job, providing them with training and a promising career in culinary arts,” according to the mission statement on their website. Each student had the opportunity to pick a leader to have lunch with and talk about their experience and careers in social change. The next round of sessions included Skill Building workshops, with topics such as social entrepreneurship, community organizing, crowdfunding, preparing effective meetings, building a world free from sexual assault, global inequality, exploited labor and human rights. After these sessions was another opportunity to reflect with students about what each of them learned and gained from those discussions. The day ended with a networking fair with more community organizations, a new feature at this year’s summit. Students who attended the Social Change Summit were also invited to compete in the Social Change Pitch Competition on February 14, 2019. Students that wanted to turn their ideas about social issues that interested them into action could create a 90 second pitch about their ideas to a panel of judges, for a chance to win $500 to start their program. The registration deadline is February 4 and spots are limited. “In addition to the pitch competition, at any point, if a year down the road one of our students has an idea, they can come to us or LaunchNET and talk with someone about their ideas,” said Julie Robinson, Associate Director of Community Engagement at the Brain Center. Robinson said that she is proud of the summit and the improvements that the program has made in its third year.